The Short Version: Ever wanted to help students learn just what they need to succeed in your industry? Ever wanted to create the perfect space for hands-on learning? Ever wanted to create projects that enable creative problem-solving? Then come join a FLN Tiger Team to do just that. Inspired by our first community brainstorm, the FLN is looking for teachers, students, parents, business people and community members to create prototypes in three areas: tools and spaces, lessons and projects and business and industry collaborations. What’s a prototype? Think of a prototype as a “little bet” - something we can try in a classroom or two before the end of the year so we could learn what works, what doesn’t and how we might scale the idea. Tiger teams will meet for three 90 minute sessions over the next four weeks, then we will pick which prototypes to test. Interested? Send me your contact information and let me know which team you want to contribute to. It is the year 2028 (read the news). Catalyzed by the success of the Warm Springs Innovation District, Fremont is thriving. Over the past decade, Fremont’s programs to collaborate with companies to produce graduates ready for manufacturing and technology careers have generated admirers around the world. Fremont is known as a global hub for education innovation and has attracted researchers, educators and governments eager to replicate our culture of collaboration. What are the key ingredients that have created Fremont’s innovative STEAM education programs and its culture of collaboration? That was the prompt for the Fremont Learning Network’s first-ever Ecosystem Laboratory held on Friday, February 2. It was a facilitated brainstorm session to identify practical next steps and generate new thinking and possibilities. Attendees included 27 leaders, thinkers and doers from education, business, community benefit organizations and government with a common interest in creating a maker mindset and STEAM skills in the workers of tomorrow. Special thanks to Mayor Mei, Councilmembers Bonaccorsi and Jones and School Board members Desrie Campbell and Ann Crosbie for joining our lunch debrief. 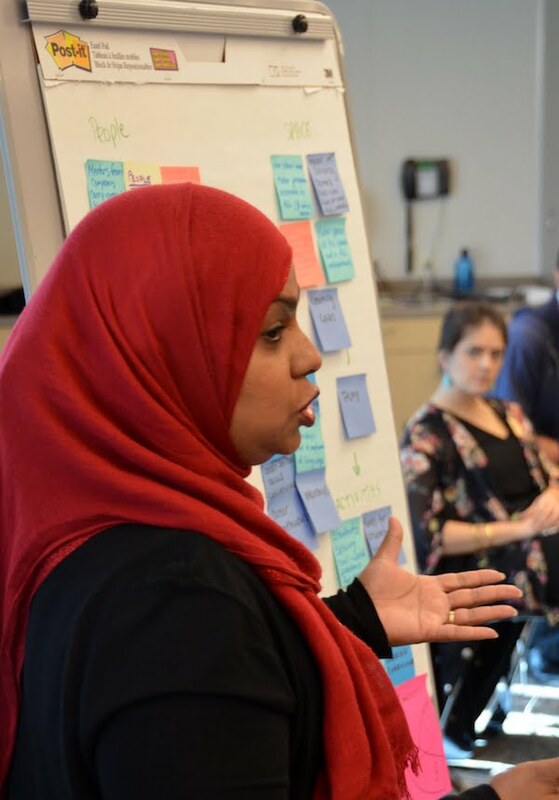 Our star speaker was Sunanna Chand, the executive director of Remake Learning Pittsburgh, a collective impact organization in Pittsburgh, PA that has unlocked the capacity of the entire city to support schools in new and innovative ways. She shared stories from the early days of Remake Learning as well as its suggestions of what to avoid. Among others, she suggested “inviting the stranger”, the phrase she used to describe the idea of making sure the network actively invites and includes members from all different parts of the community. By far the longest list of brainstorms was who else we need to include as we build the Network. Community Engagement: actively involving the entire Fremont community in creating the network, including its prototypes and programs. “Invite the stranger” is a subset of this work. Lessons and Projects: creating lessons, projects and activities across the district that can help students learn the STEAM skills, creative problem-solving, and awareness of careers that our advanced manufacturing companies are seeking. Tools and Spaces: creating access to tools and spaces in which students and community members can learn and exercise creative problem-solving skills. Business and Industry: creating authentic and relevant work learning opportunities in partnership with businesses. Culture: at a high level, participants identified culture as a key component in creating the network. Specifically, they described thoughtfully designing culture in schools that encourages mistakes and learning and understands that failure is the first step in learning. In the city, they described creating a culture of expectation in the business community, in which being involved with schools is simply part of doing business in Fremont. I’ve been thinking about these themes as buckets of work, but I think a better way to describe them is slices of a solution. In other words, each of these is a slice of the whole solution. If we do one slice without the others, the solution won’t be nearly as powerful. What good does it do to create lessons and projects without the tools and spaces in which to do them? And what good would it do to create authentic and relevant learning opportunities without embracing the mistakes they will inevitably generate? The 100 or so interviews that I did last fall helped uncover what manufacturers are looking for and, since they create one in four jobs in Fremont, they comprise the answer to “why this is important.” The model of Remake Learning Pittsburgh (and its terrific playbook) provides a roadmap for how we can do this work. Our collective brainstorm last Friday created a framework for what we need to do. It also provided a roadmap for what to do next. The kickoff was a textbook example of the role of the Network as a convener. Many of these ideas came up on my listening tour. But seeing them emerge from a community brainstorm was far more powerful and created a sense of ownership. So let’s convene again. As a next step, it was suggested that we borrow from business the idea of a Tiger team. A Tiger team is comprised of stakeholders brought together for a single, usually short-term, project. I would like to convene Tiger teams to work on three of these slices: business and industry, curriculum, and tools and spaces. Your mission (should you choose to accept it): join a Tiger team and create prototypes based on the hopes and concerns of each of the members. Think of a prototype as a “little bet”. It’s not something we need to roll out across the district - yet. Rather, a prototype is something we can test in a single classroom by the end of the school year in mid-June so we can learn. Tiger teams will be comprised of 5 to 8 diverse stakeholders and will meet for three 90 minute sessions at a time of mutual convenience at a school, MVROP, the Library or City Hall (whichever is convenient) over the next 6 weeks. I will facilitate formation of the groups and will support any and all meetings as needed. If this mission feels too ambiguous or uncomfortable, let me know. You are an innovator, an explorer, a collaborator, even if you don’t feel it. We need your creativity, your passion for our local youth, and of course, a bit of your time. If your Tiger team needs a place to start, there are many ideas from the kickoff and from my listening tour that could be used as seeds for prototypes from the teams. I also find it helpful to remember that this is an “adaptive challenge” that is, by definition, difficult to identify, requires changes in values, roles, relationships and approaches, and requires experiments and new discoveries to solve. If the process feels messy, you’re doing something right - revel in it. What are the experiments and new discoveries that we need in each slice of the solution? If you are interested in being a part of creating the future in 2028 that we described above, please send me your contact information and let me know which team you’d like to contribute to.